I've been shopping around for a beater lately. I've seen a bunch, all pretty good cars, but can't decide on which one would be right for me. This one caught my attention, big time. Based on the Mercedes Benz W124 platform, these might be some of the most durable Mercedes Benz cars ever built. I may get some arguments from MB fans here, but in my opinion this line of cars was the last of the "over-engineered" Mercedes Benz cars. The W124 design was introduced in 1984. In its day it was an incredibly advanced car. The front suspension was a simple modified McPherson strut set up, but the rear a sophisticated multilink system. This model also introduced the really fun to watch single wiper arm system. While it may look angular and disproportionate (as a friend said) it had one of the lowest Cd numbers of any non- sports car vehicle of its time, 0.29. (To put that in perspective, a 2005 Audi A4 is less slippery at 0.31). The 3.0 liter engine in this car very reliable. 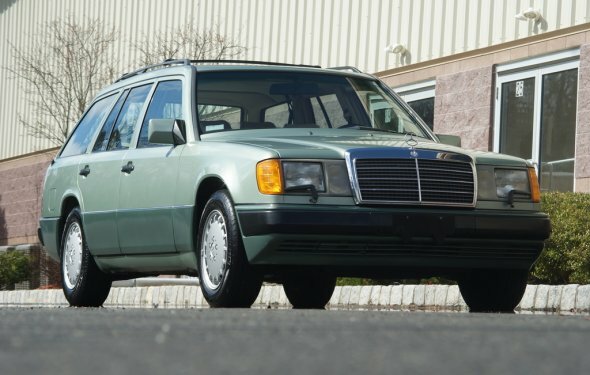 I couldn't find 0-60 times for the station wagon, but a 300E (sedan) with 4Matic got to 60 MPH in 9.2 seconds. The time for the station wagon should be similar. It's not "oh-my-god-we're-going-to-die" fast, but certainly quick enough for a large car. This car has Mercedes 4Matic AWD system. This may be the one case where MB's "over engineering" made things a little too complex. The first generation 4Matic system was originally a complex electronically controlled system with automatically engaging four-wheel drive (4WD), the system employs locking central and rear differentials to provide additional traction in slippery conditions. The center differential, also known as the transfer case, contains two clutches. Each hydraulically enabled clutch is controlled separately to allow for three modes of operation: 2WD (mode 0) where 100% of available torque is available to the rear axle while the front axle is disconnected, and two 4WD modes which allow for 35/65 front/rear axle torque split (mode 1) or 50/50 front/rear axle torque split (mode 2). The rear differential lock, previously known as ASD on Mercedes-Benz models, can also be locked (mode 3) if rear wheel slip is still present when the transfer case 50/50 4WD mode 2 is engaged. Due to safety and stability concerns there is no front differential lock. The 4Matic system uses inputs from the three channel ABS system and a steering wheel angle sensor to decide when to intervene. 4WD is disengaged automatically if the ABS service brakes are applied. Engine throttle control is not inherent in the W124 system. Two W124 variants of the 4Matic system were produced: the first system (1986-1991) used a mechanical pressure test lever to disable the system hydraulically while the second system variant (1992/1993) used an electrical test switch to break power to the system. The latter system variant when in test mode allows for continued operation of the rear shock self-levelling system (SLS) when installed. Whew. Got all that? The bottom line is that while complex, it's no more effective than Audi's simpler Quattro system. This car has an amazing 240, 000+ miles on it. It looks great. It has obviously been well taken care of. Here in New England, where rust is the big enemy, you don't often see a car this old, with this type of mileage on it, in this type of condition. The 3.0 liter engine is almost indestructible and good for another 50, 000 miles, if treated properly. The transmission and 4Matic system, having lasted this long, will probably last that long, too. This is a great "winter beater" car. Good for many more miles, it's priced so cheap ($1200.00) that when something expensive does fail on it, you can junk it and still feel like you got your money's worth.